The last concert of last season was Monday night in Ravinia which was a hot and buggy change from freezing cold San Francisco and where there seemed to be a record number of live cell phones going off at curiously strategic musical moments. It was also our last performance with Dylan and Gabe, who have now gone on to their post-Chanticleer lives, Gabe in Kansas City, and Dylan here in San Francisco. Eric, whose 21st year in Chanticleer officially begins on August 20, welcomes counter-tenor Casey Breves and bass-baritone Michael Axtell. 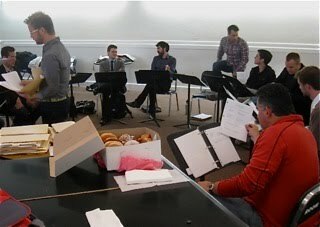 With first-day donuts supplied by Ben Jones, and piles of music for the 25 or so numbers we will learn for this year's touring program "Out of this World!" our work is cut out for us. Meanwhile upstairs Ben Johns is auditioning high school singers for the Louis A. Botto (LAB) Choir. As you may remember, the pilot for this idea happened during our National Youth Choral Festival in March. With their first session on September 3, we will be realizing a long-held dream to start an honors ensemble for the best Bay Area high school singers, working with us after school and on weekends having a very intensive choral experience, and performing at schools and community centers. There will be three sessions a year lasting 10 weeks each. The big debut of the LAB Choir will be on October 22 at our Youth Choral Festival in San Francisco. There are close to 20 singers signed up already, with room for 5-10 more! We hope you're going to love "Out of this World!" There will be music by composers from Monteverdi to Mahler and Britten and Sarah Hopkins and two world premieres - an original piece and an arrangement- commissioned by us: "Observer in the Magellanic Cloud" by Mason Bates which is about a satellite in that cloud picking up Maori chants. We will be adding Maori to the long list of languages in which we have to try to be authentic. Then Chanticleer meets indie-pop in an arrangement by Vince Petersen of Erica Lloyd's "Cells Planets." You can see the original on Youtube performed by Erica and Little Grey Girlfriend, then you can decide how you like our arrangement. So here we'll be with piles of music in front of us until we open our season on September 14 in San Luis Obispo. See you soon.